According to the inventor himself, the name has a long o sound. So "Moog" rhymes with "vogue." That is the way it would be pronounced in German! Many people have trouble saying Robert Moog's name! Can Guess the right way to pronounce "Moog?" See You at the Bottom of the Page With the Answer! So Long! Was that a hint? First performance of Brahms's String Quartet # 3 in the home of Clara Schumann. It would not be played in public until October 30. Johannes Brahms was born in Hamburg, May 7, 1833. His father played double bass. Brahms began studying the piano when he was 7, and started theory and compositon lessons under Eduard Marxsen at age 13. Marxsen was a fan of Johann Sebastian Bach, so Brahms was well-trained in the classics. 1814 - First performance of Beethoven's opera Fidelio in its modern form. 1883 - Premiere of Tchaikovsky's Festival Coronation March, in Moscow. 1934 - Inventor of the Moog Synthesizer and electronic music composer Robert Moog was born. 1945 - Les Brown went #1 with Sentimental Journey. 1960 - Everly Brothers record Cathy's Clown. 1964 - Beach Boys released I Get Around, which became their 4th #1. 1971 - Premiere of Roger Sessions's cantata When Lilacs Last in the Dooryard Bloom'd (after Walt Whitman), in Berkley, Calif.
1979 - Sister Sledge's We Are Family went platinum. From an early age Brahms helped support his family by playing in dance halls. He also began arranging music for his father's light orchestra while absorbing the popular alla zingarese (gypsy) style associated with Hungarian folk music. In 1853, on a tour with the Hungarian violinist Rem�nyi, 15-year old Brahms met violinist Joseph Joachim and Franz Liszt. Brahms and Joachim became lifelong friends. Joachim encouraged Brahms to meet Robert Schumann. Brahms and the Schumanns (Robert and his wife Clara) became great friends and artistic colleagues. Brahms moved to Hamburg in 1859 to direct a women's chorus. 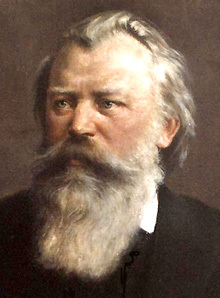 Though he was well known as a pianist, Brahms's distaste for much of the popular music of the day (notably that of Franz Liszt and the like) caused him to have trouble being accepted as a composer. Slowly he gained the public's approval with his two orchestral serenades, the Handel Variations for piano and the early piano quartets. He became director of the Vienna Singakadamie in 1863. Besides giving concerts of his own music, he made tours throughout northern and central Europe and began teaching the piano. He settled permanently in Vienna in 1868. Although Brahms composed many types of music, of special interest to violin students is his violin concerto. Concerto in D, Op. 77 Violin and Piano. By Johannes Brahms. Arranged by Y Menuhin. (Violin). String Solo. Published by G. Schirmer, Inc.
Or download the sheet music directly to your computer by clicking here! F i F A Approved. Brahms continued to have doubts, and discarded the middle two of the original four movements, replacing them with what he called "a feeble Adagio.'' When Joachim received the piece he wasted no time playing the work. January 1, 1879 saw the first performance. It was not well received by critics. One called it a "Concerto against the Violin," and questioned the ability of any violinist to perform it. Time has allowed the piece to be seen as a true virtuoso piece, and it is now part of the standard repertoire. Brahms continued to work into the 1890s. He maintained his friendship with Clara Schumann. Her death in 1896 was very hard on him. Less than a year later, on March 26, 1897, Johannes Brahms died from cancer, age 63, and was buried in Vienna.